That the left is responsible for spreading misinformation has finally been quantified in a study released by Pew Research Center on gun crime. 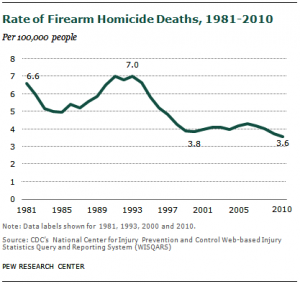 According to the study, gun crime has plummeted in recent years; however, the American public believes it to have grown. Perhaps this lack of awareness is due to the recent Aurora Theater and Newtown shootings. Or perhaps, it’s due to the left’s embrace of Rahm Emanuel’s famous phrase “never let a serious crisis go to waste”. Of course, when the Washington Post runs a headline that reads “Gun violence dropping, but most killings involve firearms, report says”, it’s easy to understand how busy Americans could come to the wrong conclusion. The Denver Post also ran the story. Interestingly, the Brady Campaign came out with a top ten list of states with the strictest gun laws. The state with the toughest gun laws was California. In 2011, California had the highest number of gun deaths (total) as well as one of the highest firearms murders as a percentage of all murders, according to data from the FBI Uniform Crime Report. That trend continues throughout much of the top ten list. Death by any means is to be taken seriously, but let’s make sure we have the right stats and an accurate perspective on gun violence, particularly with Colorado playing center stage to much of the gun debate. It will be interesting to see whether Colorado ends up on the Brady Campaign’s toughest gun laws list next year. We’ll keep you posted. Believing that people are safer because of the conceal carry laws is making a lot of assumptions in favor of those laws. It is sad that the average person has no idea that this is true. Population rose 20% while gun homicides fell 49%. At least as importantly, the vast majority of states passed "shall issue" concealed carry laws (41 states currently have that option). A lot of guns were sold in those seventeen years, as well. The fact that people are SAFER because of it, is ignored by the press. Thank you for this report. I personally have never shot a gun, but I totally believe in the 2nd Amendment, and hate how things are so twisted by the left…and by the media. So maybe they will let us buy bullets again?